A big bull moose  its girth broad and immense, its pendulous muzzle and lumpy face strangely like Bullwinkle's  was eyeballing us . He kept us in his sights from a distance of about 50 yards before stepping through a tangle of brushy willows. Seconds later, after we had followed the ski trail around a bend, he stood in a clearing only 25 to 30 yards away, his eyes appraising and evaluating. It's a good thing that cross-country skiers aren't moose food. 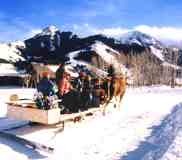 A day later, some of us again on skis and others blanketed aboard a horse-drawn sleigh, we followed Lower Rustler's trail. 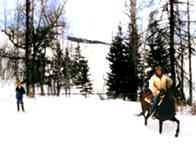 We glided along freshly-laid ski tracks past aspen meadows and meandered through thick stands of lodgepole pines, Engleman spruce, and whitebark pines to arrive at Rustler's Cabin. In contrast to the cloistered views that had limited our long-range vistas a day earlier, the expansive panorama was truly Big Sky blue and bold. From trailside viewpoints we gazed across Tom Miner Basin and Paradise Valley, layered with frosting-like snow. Knife-edged peaks of the Absarokas Range of the Rocky Mountains extended before us from southern Montana into northwestern Wyoming. Welcome to the B Bar Ranch. The B Bar isn't just for cows and cowboys. 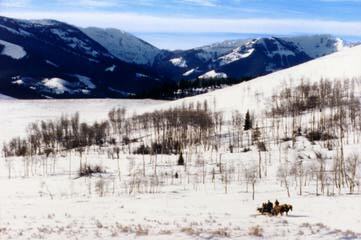 In winter, the southern Montana cattle ranch is a fantasyland dude ranch for cross-country skiers. Over five days my wife Mary and I skied a variety of easy to challenging trails, groomed for classic and skate skiing. Contrasts were part of the enjoyment. One morning before sunrise we loaded aboard hay-stacked wagons towed by Suffolk Punch draft horses to feed the ranch's herds of horses. Another morning, a Nordic instructor drilled us on techniques. Most unusual of all was the afternoon we skijored  like waterskiers, we held lines connected to a buckaroo who tugged us around on our skis behind a trotting horse. We skied as hard as we wanted, and sometimes out of necessity. Three times a day we were tempted with sumptuous spreads, including unforgettable evening meals. Gourmet dinners featured bison tenderloin that we could cut with a fork, Chilean sea bass, Alaskan crab legs, slow-cooked prime rib, a garden's variety of fresh vegetables, warm-from-the-oven breads, and a cornucopia of desserts like homemade pistachio ice cream and chocolate-pumpkin-cheesecake. Between December and early March, the B Bar feeds only guests and staff, not cattle. The 600 cows and calves that normally feed on the high elevation ranch (6,600 feet) are moved to lower elevation grazing lands 75 miles northeast at Big Timber. 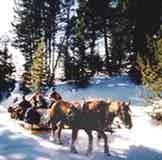 During winter the ranch's 9,000 acres are crisscrossed by 40 kilometers (about 25 miles) of ski trails groomed by Suffolk Punch-pulled wagons. Two trails lead to a pair of well-equipped wood cabins and a third to a liberally stocked warming hut. 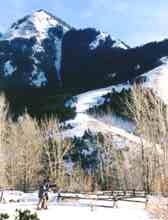 During weekdays the ranch is a destination Nordic ski resort. On weekends, cross-country skiers make day or overnight trips from Bozeman and other Montana towns. It's nine miles off Highway 89 by gravel road to the backwoods B Bar, which is bordered by other large working ranches along the Gallatin National Forest and northern boundary of Yellowstone National Park. Its proximity to Yellowstone is a reason we saw the moose, herds of elk, rough-legged hawks, and frozen wolf tracks. The region is also seasonally populated with white-tailed and mule deer, black and grizzly bears, bighorn sheep, mountain lions, coyotes, badgers and an array of bird life, including great blue herons, song birds, woodpeckers, bald and golden eagles, and sandhill cranes. 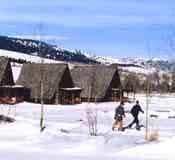 Overnight visitors stay in six guest cabins or rooms in the large, classic lodge. 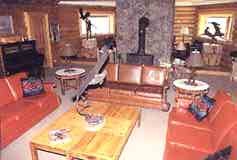 Activities in the classically rustic lodge center around the Big Room, which has art-gallery-quality sculptures and paintings, a wood stove, player piano, shelves stuffed with books and games, and nap-inducing overstuffed chairs and sofas. One night we listened as a Tom Miner Basin native talked about the area's geology, wildlife and evolving agricultural practices. The B Bar is owned by Maryanne Mott and Herman Warsh, who bought the ranch in 1978, opened it to summer guests in 1993 and launched the winter-time cross country ski offerings in 1997. From May to September, the ranch hosts up to 32 visitors, who have their choice of riding along with ranchhands, fishing (catch and release), or hiking a network of trails. But winter at the B Bar is both quietly elegant and savagely wild. One afternoon I skied in a virtual whiteout, fighting headwinds along the Anderson trail to the Anderson cabin, then turned around and glided back to the lodge like a sailboard with a full spinnaker along the creekside Willow Way trail. Powerful gusts sent the snow spitting like ashes from a campfire. But clearing skies that night left the sky splattered with stars that glowered and shimmered like the tips of tiny silver sparklers. Then, the day we left, we watched with fascination as a parade of elk with tree-sized antlers milled atop a rise. In winter, the B Bar is a place to kick and glide, or just kick back. 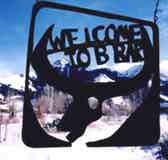 Click here for details to plan your own trip to the B Bar Ranch.